To counteract the heavy Yom Tov meals in the preceding weeks, we’ve been eating light dinners this week. Last night, we enjoyed this easy and delicious dairy soup with homemade sushi and salad. 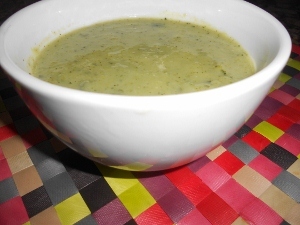 The recipe makes quite a bit of soup and has a rich taste considering the minimal calories. Put sliced zucchini, broccoli, water and salt in a pot. Cook until zucchini is cooked (approximately 1/2 hour). Blend contents of pot with an immersion blender. You can keep a few chunks if you like it that way. Add the milk, heat through, and season with garlic and pepper.